The summer is soon over and it is time to prepare for the first event of this fall. 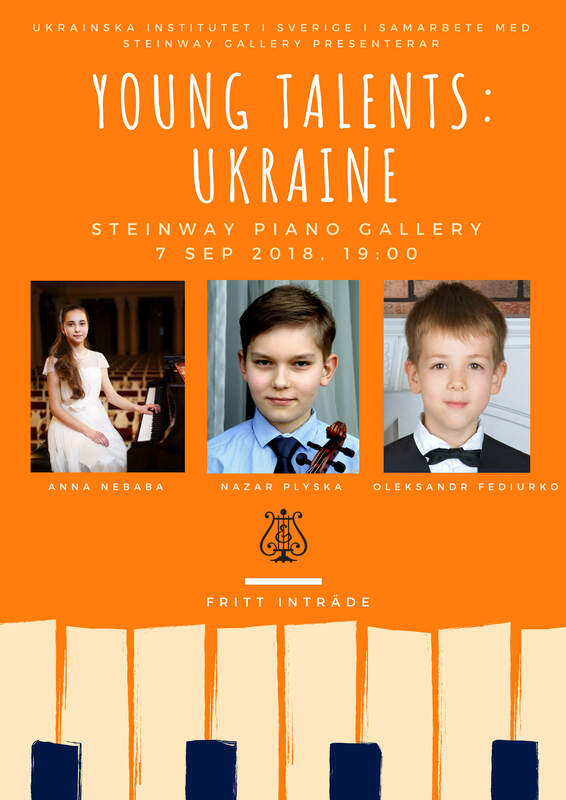 Together with the Steinway Piano Gallery, the Ukrainian Institute of Sweden presents “Young Talents: Ukraine!” Three young future stars from different parts of Ukraine will perform piano solo and chamber music, both famous repertoire (eg Bach & Beethoven) and Ukrainian music. Oleksandr began studying in a music school in Kyiv at the age of 5. His first piano competition was “Piano Talents” in Milan, Italy (2016), where he won 1st prize. He also won 2nd prize at Grotrian-Steinweg International Piano Competition in Braunschweig, Germany (2017); 2nd prize at International Competition for young piano players “Amadeus”, Brno, Czech Republic (2017); 1st prizes at Volodymyr Krainev Piano Competition in Kharkiv, Ukraine and Vladimir Horowitz Piano Competition in Kyiv (2018). He also took part in the concert “Wunderkinder” in Italy (2017).